Enlarge Image PNNL scientists Eric Hill and Leo Kucek compare culturing conditions in samples generated from a novel photobioreactor designed at PNNL. Results: As society's demand for renewable energy continues to grow, hydrogen (H2) is appealing because it's carbon-neutral, portable, clean, and simple. However, producing it inexpensively and in sufficient amounts without using fossil fuels remains a challenge. 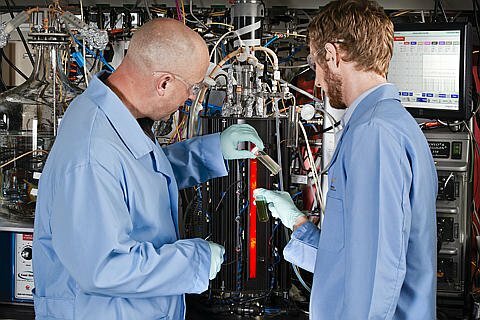 Scientists at Pacific Northwest National Laboratory recently made a significant step toward meeting that challenge by achieving uninterrupted, sustained H2 production from a photosynthetic microorganism for more than 100 hours in the presence of oxygen gas (O2). Apparent O2 inhibition of H2 production in traditional cultivation systems has resulted in the long-held belief that sustained H2 during photosynthesis was not possible. The PNNL team grew cultures of Cyanothece sp. ATCC 51142, a nitrogen gas-fixing cyanobacterium, in a specially designed photobioreactor in which the light environment and composition of dissolved nutrients and gas phase could be rigorously controlled and monitored. Using this approach, PNNL scientists were able to provide the microbes with favorable conditions needed to produce H2 continuously without significant photodamage or decay in required enzyme activities. 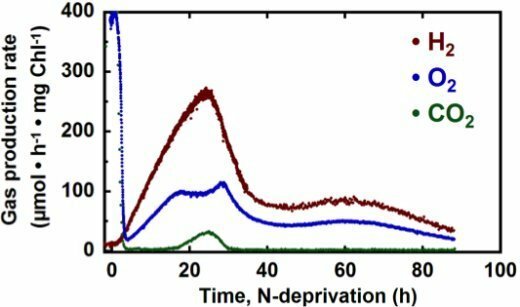 Why It Matters: The results not only demonstrate that uninterrupted H2 production in unicellular cyanobacteria can be achieved over a number of days but indicates the feasibility of "direct biophotolysis" with sunlight and water serving as the primary substrates for H2 production. That is, when cells "split" water in photosynthesis, some of the molecular products can be directly used to make H2. Furthermore, this occurs even though O2 is being produced, which typically inhibits the enzymes producing H2. Detection of concomitant production of both H2 and O2 by N-deprived Cyanothece 51142 cultures in the light. According to Dr. Alex Beliaev, a PNNL microbiologist and senior author of the paper, which was published in mBio, "Our study provides an important insight into the photophysiology of light-driven hydrogen production by photoautotrophic microorganisms. It also has significance for biotechnology-the sustainability of our process is a solid foundation for developing an effective, renewable, and economically efficient bio-hydrogen production process." Methods: Using a novel photobioreactor designed and built at PNNL, the scientists grew the bacterial cultures under conditions where an enzyme (nitrogenase) that can produce H2 was induced. Hydrogen production occurred when conditions were shifted so that the normal substrate for nitrogenase (N2 gas) was not present. The ability to monitor and control gas and light input into the system afforded high-resolution physiological details, opening a window on the relationship between O2 evolution and H2 production in the light for unicellular cyanobacteria. What's Next? The scientists are planning ‘omics studies and measurements to identify what the cells are doing at the molecular and genetic level to prevent the inhibition by O2. Acknowledgments: The research was supported by the U.S. Department of Energy Office of Biological and Environmental Research, Genomic Science Program and is part of the PNNL Biofuels and Foundational Scientific Focus Areas. Reference: MR Melnicki, GE Pinchuk, EA Hill, LA Kucek, JK Fredrickson, AE Konopka, and AS Beliaev. 2012. "Sustained H2 Production Driven by Photosynthetic Water Splitting in a Unicellular Cyanobacterium." mBio 3(4):e00197-e00212. DOI:10.1128/?mBio.00197-12.